Yes indeed – it’s hot, and dry. The sea beckons. As much as is allowed by law and social decorum, I’ve been at the beach with as little on as possible, and more often than not in the water rather than just sitting on the edge. At last I am understanding why Maximus was always banging on about being a fish – it is truly lovely to be able to float around, without a care in the world, immersed in considerable amounts of clean clear water. 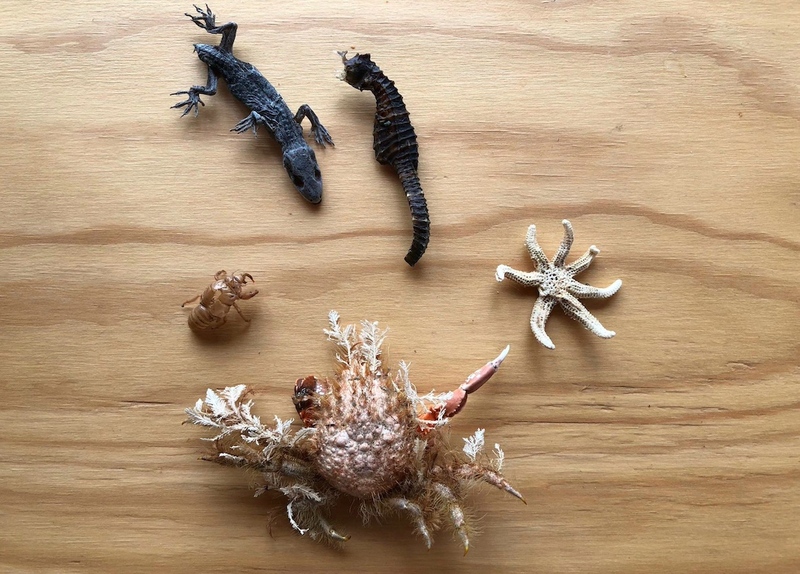 Not so much luck for this assortment of flotsam and desiccated offerings – the crab, disguised by underwater subterfuge, is a thing of beauty – I can honestly not tell where the crab ends and the seaweed begins. The cicada – yes, a standard crispy packet of summer goodness, zzzz-zzzzz-zzzzz on the nearest power pole. More impressive than that is the little starfish, sadly it was marooned on a pebble and dried rock solid in the harsh sun. The last two treasures: first, the dried seahorse – I’ve never seen a live one out in the wild, but this is the first dead one I’ve seen as well. Fascinating and fragile. Lost its nose, poor thing, but still an absolute treasure. And then, just today – a mummified lizard. Skink? Gecko? Hard to tell. But beautiful, just the same. Not really sure what to do with these critters, so I thought I’d share them with you. There is also a dead, dried, desiccated rat, in full-on mummy condition, but he is not quite so photogenic. Mind you, in death, I won’t be so pretty either. But I’ll spare you the rat, for now. I am hugely, uncomfortably aware, that as wonderful as this patch of good weather is, or has been, it is a sign of some really screwed up things happening on our planet. No, not talking about Trump, or Isis, although they are part of the problem too, but of course: climate change, caused by anthropogenic-induced global warming. It just seems so obvious to me that there are far too many people on the planet, and that many people need to die, for the good of the rest of the animals and plants that live here. There is over 7 billion now, and the ‘experts’ tell us that we might round off at about 10 or may be even 11 billion humans on planet earth, if we’re lucky. I don’t know about that – sounds awful to me. So much futile wasting of energy, so much destruction of food, so many corrupt companies and politicians. And meanwhile, we just sit here, doing nothing to save ourselves, thinking that turning out one light will make a difference – what really would make a difference is the wholesale slaughter of about 5 billion people, but that is hardly likely to happen. Unless, of course, Lovelock’s Gaia theory comes to fruition, and Mother Nature zaps us all with the Asian bird flu again. 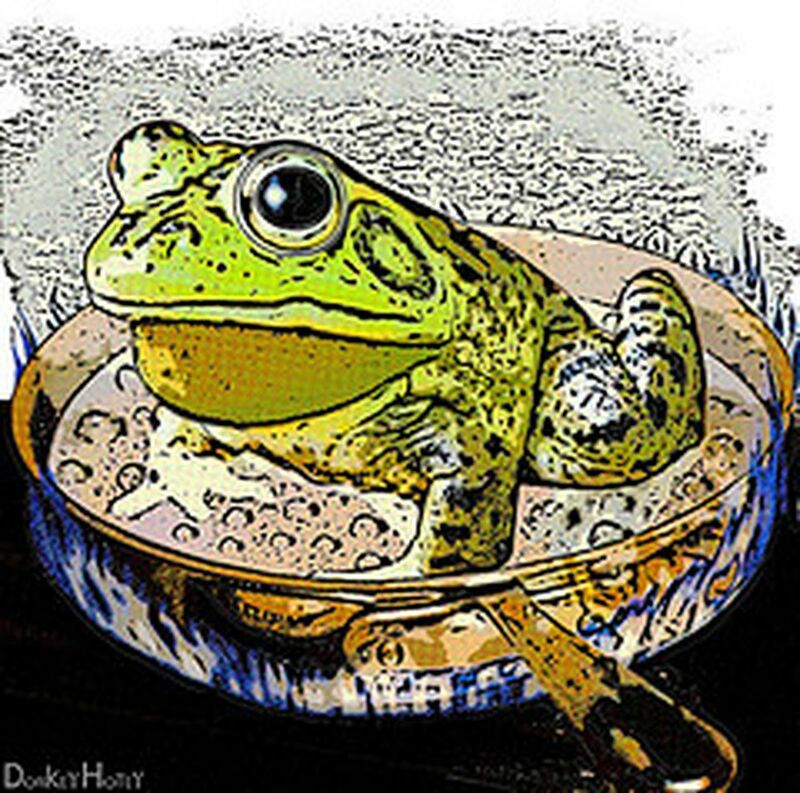 At present, we seem to be for more like the proverbial Frog in a saucepan of warm water. Hmmm, it is getting warm in here, I like it. Hmmm, it is getting even warmer in here, I must be so lucky to have a nice warm place to sit. Time to jump out of the pan? Or just stay for a little while longer? Hmmmmmm, now I’m dying of dehydration. What an oddly depressing post. Are you feeling alright? No, evidently, I’m feeling rather hot, and bothered, and not a little depressed. I think I need another swim. But nice of you to ask. Perhaps a mini-break in the deep south? Starkive – I can’t access that link – Unesco appears to have a server dating from 1950, judging from the speed of their connection. So I’m wondering what you have posted. At a guess, perhaps, Oamaru ? Oh – I am there with skates on ! Would love to visit those far off places. Incidentally, was at a thing about Antarctic tonight – celebrating Roald Amundsen’s achievement at being first to the south pole. Hooray for Norway! The question raised was: was Amundsen a hero? was Scott a hero? or was Scott just a loser? Hi Levi – and while as Alan said ‘oddly depressing post’ given your usually sunny disposition, it is good for people to be talking about the pressure we are putting on the planet. You are absolutely right to mention global population. In all the talk about climate change and indeed almost every aspect of environmental management population seems to be a taboo subject. I was reading up on the numbers again yesterday. The global human population has grown from 1.5 billion in 1900 to 6.1 billion in 2000, and is now 7.6 billion, with the expectations being around 11.2 billion by 2100 which is expected to be about the peak. Thing is we are also told the carrying capacity of the planet (arable land and water resources) is about 9-10 billion – and if we are all vegetarian. Also that we are already overshooting planetary resources by about 50% – effects include massive biodiversity and habitat loss, climate change etc. So it is a combination of how many of us there are and how we use resources. The pot is undoubtedly getting warmer. First step is recognising that. Then there’s the hard questions about how we turn down the temperature so we don’t cook. Everything else is small stuff in comparison. And Scott and Amundsen – both incredible brave men and heroes without a doubt in my books. Did you know Amundsen died in 1928 when part of a rescue mission for an airship in the Arctic. His plane went missing and has apparently never been found. I was raised on a diet of pukka British heroism, often demonstrated in the midst of self-inflicted disaster – the likes of Gordon of Khartoum, the mounted cannon fodder of the Light Brigade and the colonial administrators broiled in the Black Hole of Calcutta. Along with Custer and co they came to seem a bit stupid to me. At the same age I used to puzzle over the “Gentlemen v Players” match held annually at Lord’s cricket ground and described at length in Wisden. What was that about? Why were gentlemen not players? Were players somehow not gentlemen? Which team should I support – albeit weeks later and thousands of kilometres away? Eventually it dawned on me – I would never be asked to play for the Gentlemen. While Shackleton seemingly specialised in surviving disaster (and helping his crews to do the same) and Amundsen committed the compound sins of “professionalism” and “foreignness”, Scott seems to fit pretty squarely into the category of well-connected amateur. Questioned about the thoroughness of his preparations for the Antarctic he reportedly said, “gentlemen don’t practise”. Yes, indeed – amateurs just die, proudly, for their country. Should have bloody well practiced more! Meanwhile, Amundsen eats his dogs, and survives. What became very clear from the talk last night was that Scott’s walk was doomed from the outset, by his decision to take ponies, instead of dogs. As one of the explorers in the audience said, you have to carry an awful lot of carbohydrates for a donkey to stay alive, and when they die, the other donkeys won’t eat them. Whereas Amundsen took 97 Huskies, and planned his schedule to eat half on the way to the pole, and the rest on the way back, when loads were lighter. Starkive – I’ve always thought of you as an impeccable gentleman, but not a hoighty-toighty upper-class Englishman. And all the better for it. Andy – nice to see you back here, and thanks for your comments. Hey, I’m interested to know what you are doing nowadays. I see that you are still at the Council – would have been interesting to have had you in Parliament, but it seems that was not to be. So – you’re not in charge of Transport any more? That’s gone to Calvi-Freeman? And so you’re in charge of Urban Development policy now? Anything we can do to help? Regrettably that failed training for Empire was courtesy of the New Zealand state school curriculum in the 1960s – along with italic script and folk dancing. Don’t get me started on Von Tempsky (or the folk dancing). Hi Levi – thanks for your kind ‘welcome back’. You also asked how you and the contributors to Eye of the Fish can help. It would be really good to have some intelligent and constructive feedback (a hallmark of Eye of the Fish) on the really big problem of how Wellington can best accommodate growth in population, and indeed how big we want to become. That fits too with your cheerful tone about frogs and boiling pots ! Next month we are due to receive information about our urban development capacity under current planning settings. We will not have sufficient capacity and that will be exacerbated by resilience risks, infrastructure capacity and the limitations we may want to impose because we value certain aspects of the city. There will need to be some very interesting conversations with the community and some challenging decisions.